Continuing first part, in this part you will learn how to organize your data, this involves displaying your files & folders, finding programs, sorting and arranging, and accessing disk partitions & external storages. Yes, this means you can also place shortcuts on desktop area & panel. 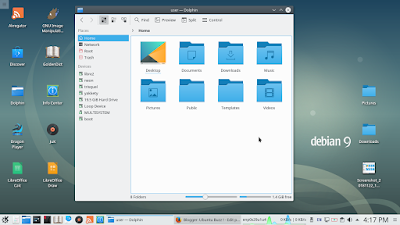 On Debian KDE, this is very easy. 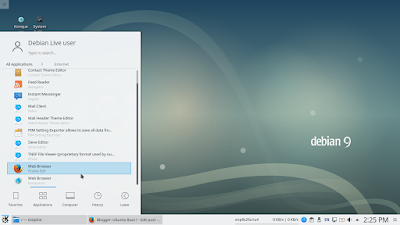 Once again, you can get Debian KDE in the website. Enjoy! 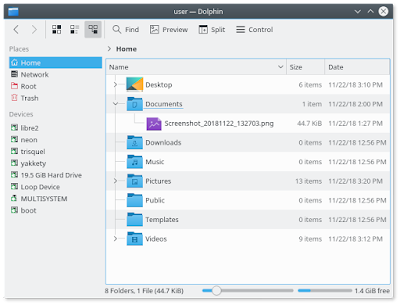 Before going into your data, you need to know how to use Debian KDE's user interface in brief. With GUI system, touching data means touching user interface. 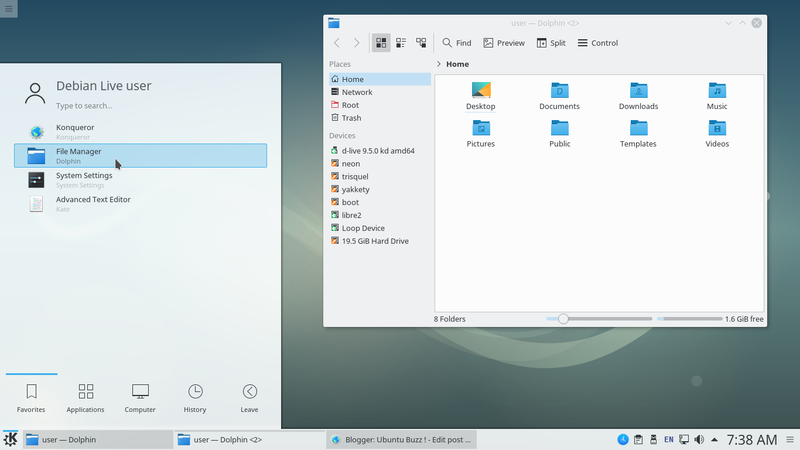 Fortunately, Debian KDE is very similar to Microsoft Windows in a way of its appearance structure and how your clicks control it, so your previous experience will need no changes as they are useful here. The only thing you need to be aware of is single-click here replaces double-click. No different to your previous OS, here, every file named with a file name ended with an extension, for example mypicture.jpeg for a picture file and cityjourney.mp4 for a video file. Every directory (also called folder) symbolized by blue box without any extension on its name. For your disk partitions and external storages, they are displayed on left panel under the Devices section. It's green when active (mounted), and red when inactive (unmounted). (*) the one you should be cautious for. Knowing these information, now is the time to go dive to your files. Click the blue folder icon (that's Dolphin, your file manager, your life partner). 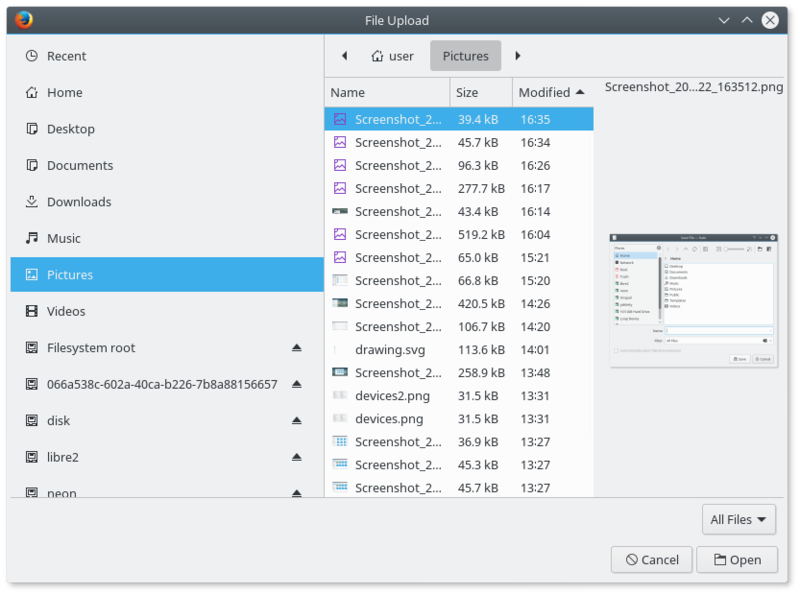 Here you will see your filesystem starting from your private folder (called "Home"). Opening a folder is enough with single-click, not double. Press Ctrl+L and type / to see your whole Debian KDE system. Press Ctrl+L and type /usr/share/wallpapers/ to see your Debian KDE wallpaper pictures. 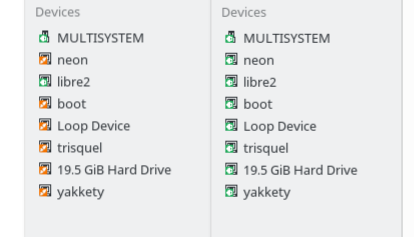 Press Ctrl+L and type /usr/bin/ to see all your installed programs in Debian KDE. Press Home logo to go back to your Home directory. If your username is debianman, for example, then your Home directory should be /home/debianman/. Press left arrow button to Go Back one step. For this purpose, the easiest one is by opening the start menu. You can click the menu button to reveal the menu, and, fortunately, you can also press Super key just like in your previous OS. Hover your mouse cursor to any folder you will see a ' + ' button showing. Click the ' + ' button you select that folder. That's selecting on Debian KDE. Click once, not twice, a folder. That opens the folder. Click once, not twice, a picture. That opens the picture. Click once, not twice, a video. That plays the video. Click and hold a file, move your mouse cursor, and release it, and select Copy Here. 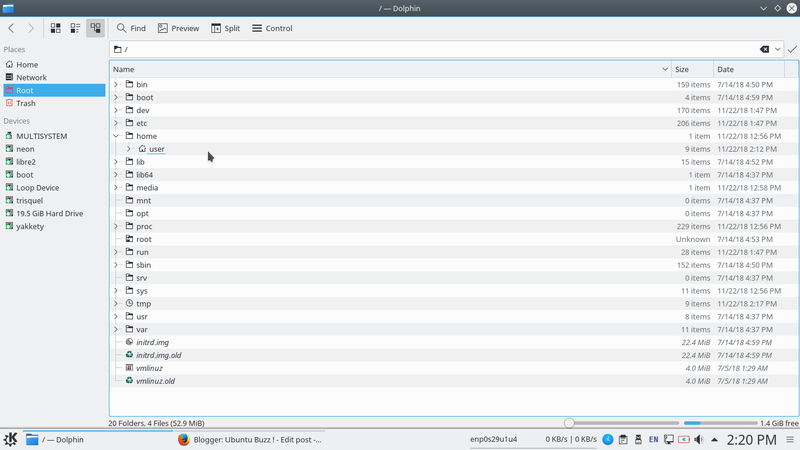 A little bit different, but that's how drag-and-drop on Debian KDE works. You may change between tree and thumbnails styles. Simply press Ctrl+1 or Ctrl+2; or click first and third button on the toolbar. Which one do you prefer? You can sort your files according to Newest by selecting Sort By > Modified > Descending. Other categories are available as well. You can group your files! Grouping means arranging files under categories with a horizontal line on each group. See this example. With detailed view mode (Ctrl+3) you see more information with same view space. Many people love this mode much better than thumbnails view mode. If you activated it, you can do sorting and arranging much more faster and better. Not to mention, the information displayed are easier to read as it's organized top-down with tree hierarchy. See below. Press Ctrl+F to Find (Search) files or folders. 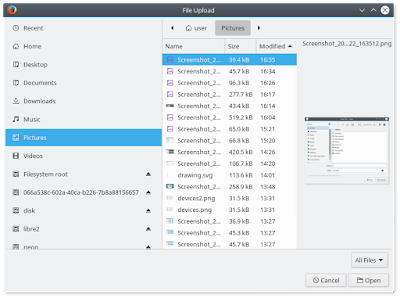 Debian KDE is very quick in this purpose and every search result displayed immediately without waiting all results finished (called "incremental search"). Quick access is called bookmark. You can drag-and-drop folders you love the most to left panel so you can quickly go to them. No need to manually browsing them anymore. See below. Debian KDE supports desktop shortcuts for files, folders, as well as programs. You can drag-and-drop items from start menu, or, files from Dolphin File Manager, by choosing Link Here every time asked. If you cannot do this, see more info below. How about panel? Can we put programs icons there? Yes, we can! Even you can put your favorite folders as well. Simply drag-and-drop either from start menu or Dolphin File Manager. No difference. With programs which can save and open file, like, LibreOffice Writer and Firefox ESR on Debian KDE, we will always deal with File Chooser dialog. 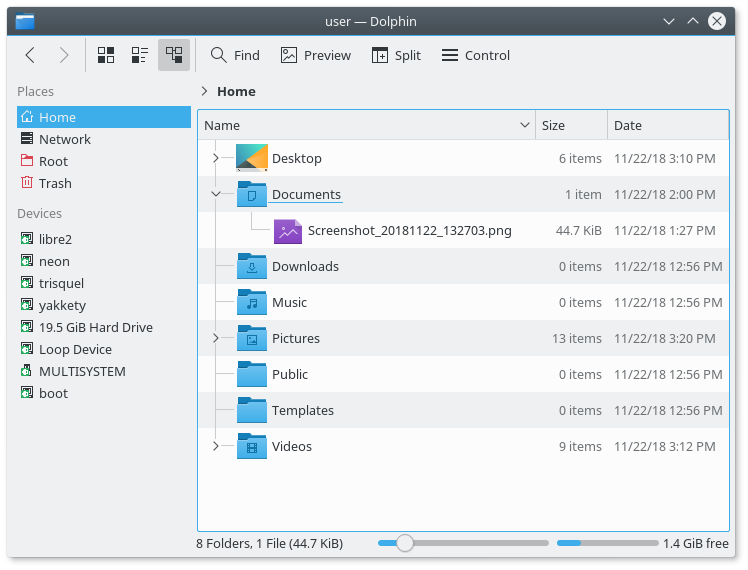 It's a thing similar to Dolphin File Manager but looks simpler. Its purpose is to help us choose file location. 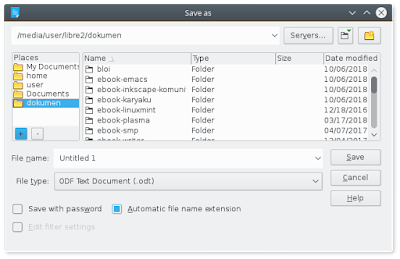 The secret is, there are three different kind of File Chooser dialog on Debian KDE. What you need to learn is your filesystem structure especially your Home directory location. On Debian KDE, your disk partitions are located specifically in /media/[your_username]/[your_partition_name]/. Bookmark it if your document folder located on other partition. With LibreOffice Writer, you will see File Chooser dialog like this one. You will need to make bookmarks (see left panel) like this so when you save file your target folders are easier to access. Click ' + ' when in a folder to make a bookmark of it. 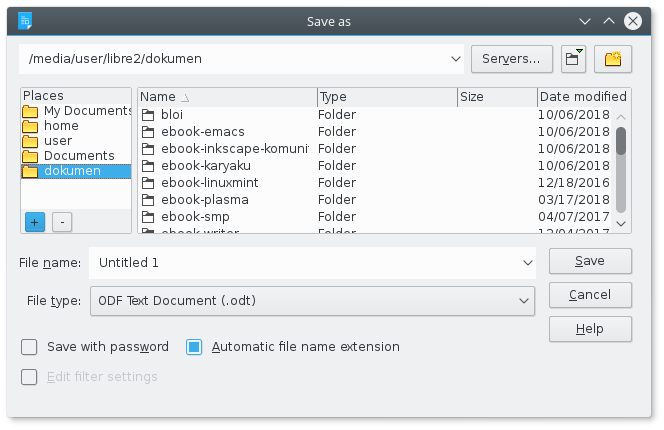 With Kate Text Editor and other KDE programs, you will see File Chooser dialog like this one. 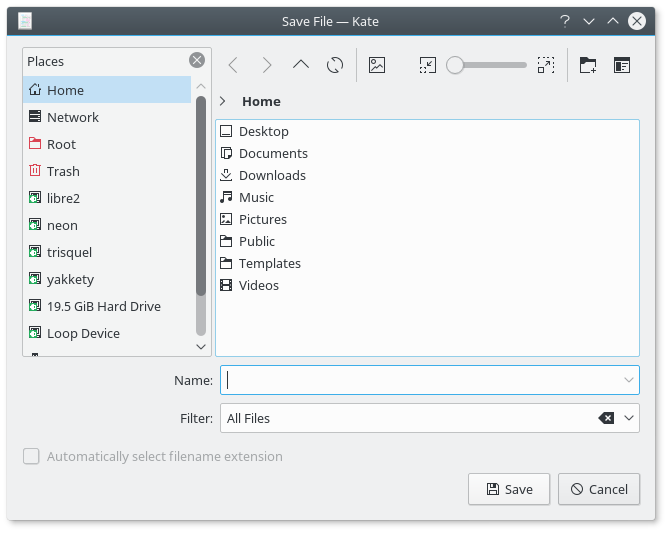 It's the original KDE file chooser dialog. Same as before, make bookmarks to your document folders or partitions to make saving easier. Drag-and-drop to make a bookmark. With Firefox ESR, to upload file, you will see File Chooser dialog like this one. 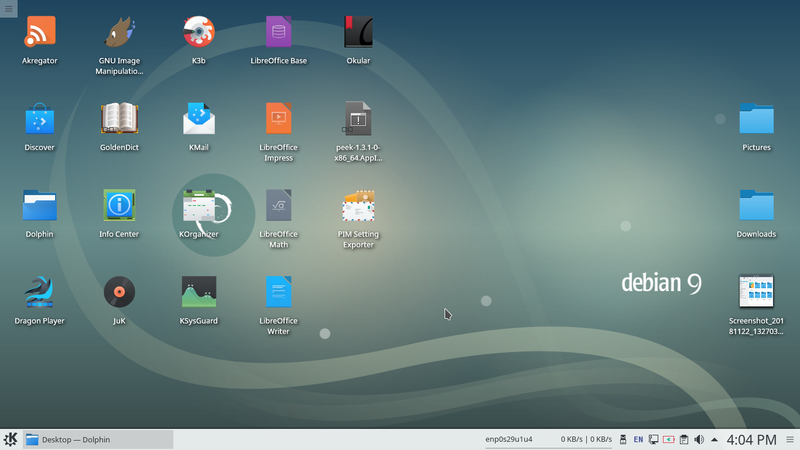 It's from GTK+ library. Right-click > Add to Bookmarks to make one. That's all. I hope you can operate Debian KDE well for your data starting from today. Next time I will discuss closely about working with programs. Happy working!